Well, I am about to get a good workout in and spend the day with hubby:) Have a wonderful week! This suitcase is great for an executive who is what you are !! I love the orange color of your scarf has good vibes. You have a successful dress code. 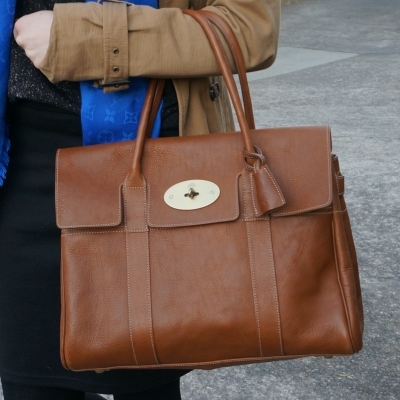 hehe thank you, the bayswater is a very professional looking bag! I love the second outfit, orange and blue look so good together! Thanks Kay! I think I just prefer them without tights! I love how you always use contrasting colours! the bright red and blue somehow give me Christmassy vibes? I'm probably just excited for December lol, you look lovely! Your tassel earrings are such a fun addition to both of these outfits. I'm glad you figured out a way to make them work in your lifestyle without having to worry about grabby hands! 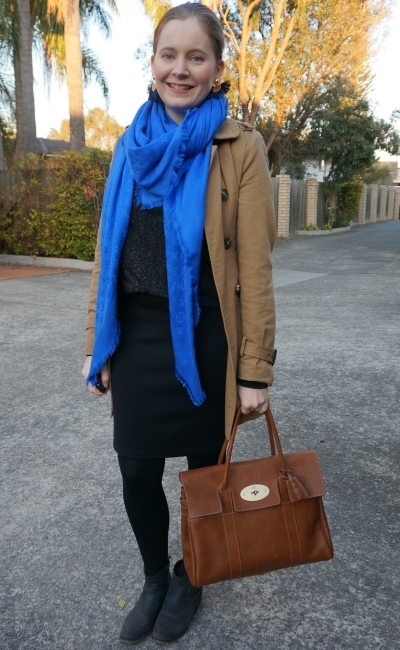 I absolutely love the pop of colour with the scarfs - especially the blue one!! Thanks Gabby :) I love the way it pops against the black! I am such a fan of monochromatic looks, Mica, and you pulled these off really well. 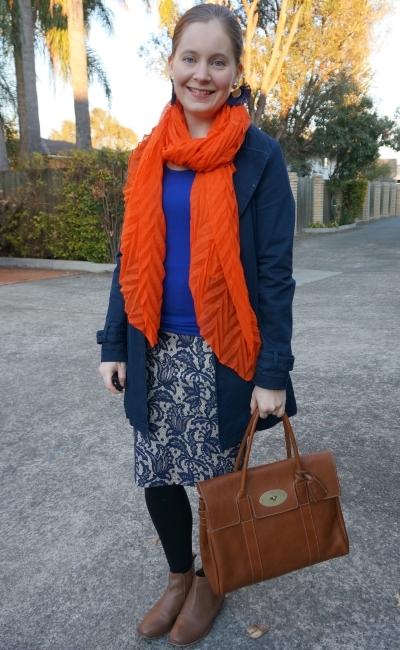 I love how accented both outfits with the pop of colour from the scarves. I love your pop of color with the scarves! My daughter surprisingly leaves my statement earrings alone. I tell her "one finger touch" and she will touch them and then forget them. She pays less attention to them than necklaces or bracelets. Love the ones you got. My boys are obsessed with them, they love my accessories! I also had a family member's earlobe destroyed when someone grabbed their earring so I'm very cautious! I love the monochrome with a pop of color look. I think you pulled it off wonderfully in both cases, but the black is my favorite. Hope you have a great week. You can never go wrong with a monochrome outfit. You so have me wanting to add an orange scarf to my collection. Have a great week. Thanks Amy! It's a really fun colour to have! 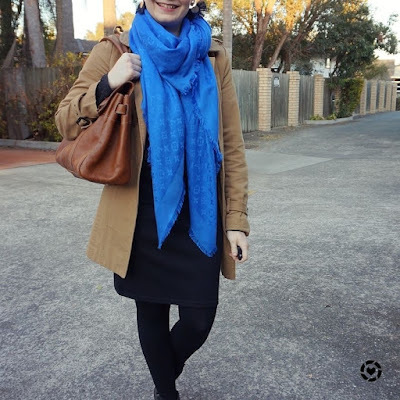 Love the first look, all black with the bright blue scarf. I am not too sold on the second look, the colors look great but the blue top here does not do the magic for me. 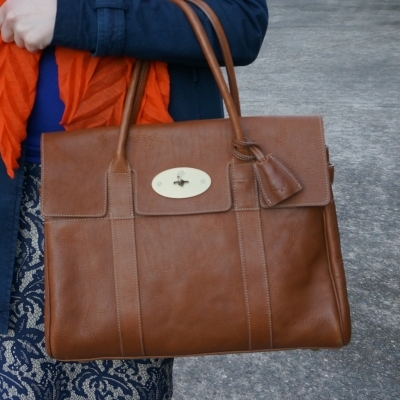 I really love the monochromatic look, and I always appreciate your beautiful bags. have a wonderful day, Mica! You'll be layering up soon! Hope you get a few more days of summer though! What a gorgeous selection of scarfs! It's funny you have literally picked out the same vibrant colours I chose for some new Tank Tops to go with Jeans, the same blue and vivid orange. Gorgeous colours and they suit you SO nicely! How fun is that orange scarf! Spring is here in Adelaide too, except for the cold winds that blow here and there. But love that we can now enjoy some sunshine! Same in Brisbane - lots of sunshine but a little windy still! the fall is kicking in sooner than I expect. Great looks, but I LOVE the all black with that gorgeous pop of blue!! 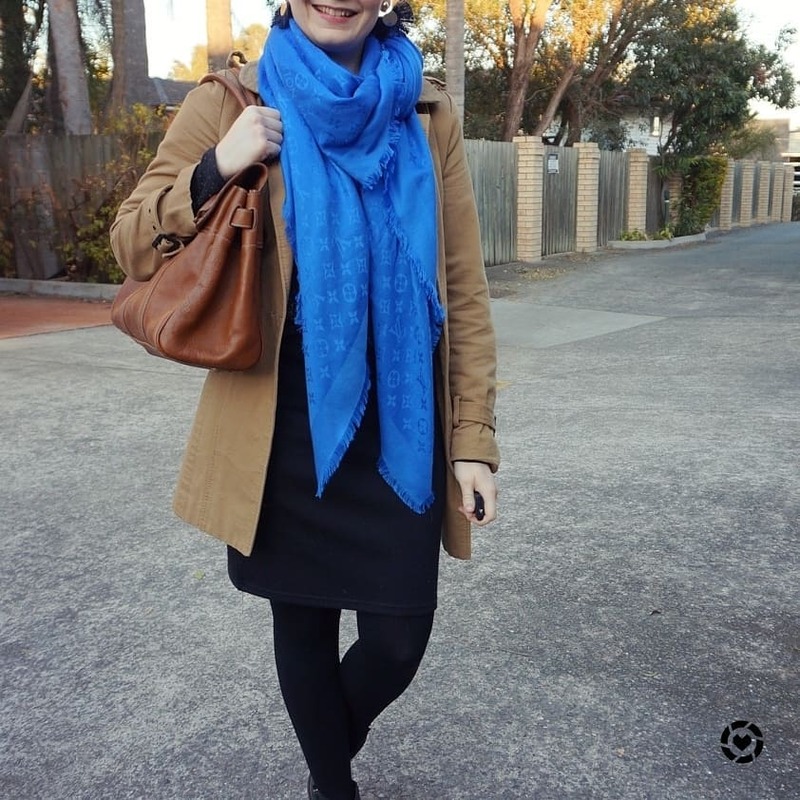 blue is your colour, look at the first picture how perfect the scarf is matching with your eyes! I love both looks and I can imagine you are happy with the long sleeves that keep you warm. And I'm not surprised what you get that compliments! Thanks so much Rena :) I do love wearing blue. Monochrome for the win! I love the bright pops of color, too- adds some oomph and keeps things fresh! 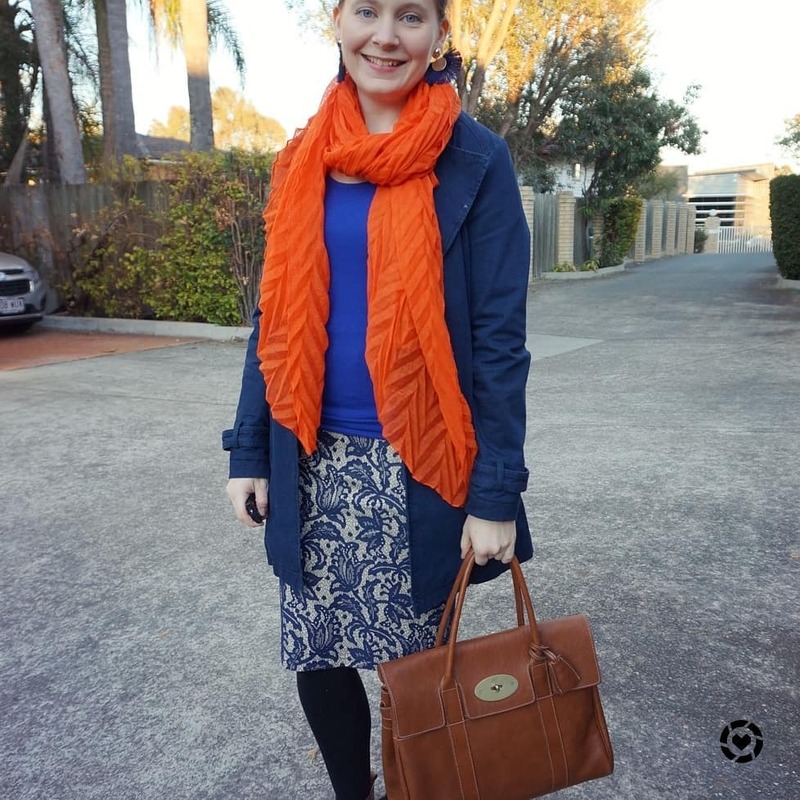 I love how your scarves pack such a lovely pop of color! I need to wear mine more (though they are mostly silk ones!) I have similar tassel earrings too and they are so fun! haha thank you! The orange one is just $10, so affordable! I love both scarves, but I especially love that first one! Cobalt looks so good on you, girl! Thanks for sharing and I hope you're having a great start to your week so far! The tassel earrings are so much fun! I love buying things like that, but rarely wear them. I love the pop of blue in the first outfit! 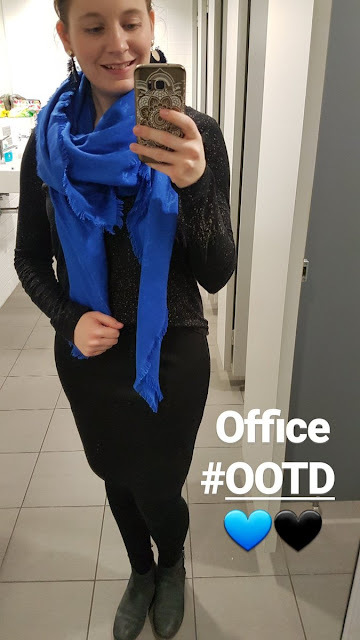 You always use the best accessories with your outfits and it's kind of cool that your dress code at work is more on the casual side! You look lovely! Have a great week! Ooh I do love those fun tassel earrings but I get how fascinating they can be for little grabby hands too. I usually reserve all my fun jewelry for work too :) I love the pop of blue in that first look, it works so well! You always have the coziest layers dear. Love scarf, such a chic pop of color from your outfit! The navy and orange play so well together! I also love that bright blue scarf you wore with the first monochrome outfit. It's so bright and pretty on you! You've really done well with your scarves lately, Mica! Both of these really make both outfits sing. Love the tassel earrings - they are so pretty with your hair back. Thanks Sheila! I feel you don't get to see them well with my hair down! oooo, that bag is luscious! love the shape and classic style! I would absolutely wear both of these outfits! Your earrings are so pretty and I love how the bright scarves really pop against the darker clothes! I have total bag envy over here too! I really love your printed pencil skirt - your office attire is always so cute and comfy!